Okay, so this is one of those holidays that just make you say, “Hmmm….” But, really, you know…why not? Made of the same material as the umbrella, and either slippery enough to slide right off or maddeningly tight enough to require superhuman peeling abilities, the umbrella cover is apparently the subject of controversy: Is it useful or just a waste of material? One woman who is firmly on Team Useful is Nancy 3. (formerly Arlene) Hoffman, who–in 1996–founded the Umbrella Cover Museum. First displayed in Hoffman’s kitchen, her collection has grown from “seven or so” covers to more than 700–enough to warrant mention in The Guinness Book of World Records. The museum is now housed in two rooms on Peaks Island, Maine. Today’s holiday was officially recognized in 2014. To learn more about Nancy Hoffman and her collection, visit the Umbrella Cover Museum’s website. Copyright Maral Sassouni, 2017, text copyright Jackie Azúa Kramer, 2017. Courtesy of simonandschuster.com. This poetic travelogue did not convince Elephant of the umbrella’s provenance, but he offered to let Hedgehog ride along and share in its protection. The two came upon a Cat, who took one look at the green umbrella and recognized it as her tent. Hmmm…said Elephant and Hedgehog. It was true replied Cat, and she related how when she visited the woods to study plants and flowers, she would rest in its shade and drink a cup of tea. Well, Elephant could play this game too. The umbrella was his and his alone. When he was a child, Elephant said, the umbrella was his pirate sword, his tightrope balance, and his baseball bat. By this time the rain had stopped. Elephant rolled up his umbrella and said good-bye to the Hedgehog, the Cat, and the Bear. The three couldn’t stand to see their boat/tent/flying machine taken away, so they clung to the Elephant. A moment later they met an old Rabbit. “‘I believe you have my cane,’” he said. The others thought he was wrong. But this handy stick, the Rabbit explained, had helped him climb pyramids, hike mountains to ancient ruins, and navigate dark caves full of treasure. Again the Elephant objected, but seeing the old Rabbit mopping his forehead, he opened it and shaded the Rabbit from the sun. 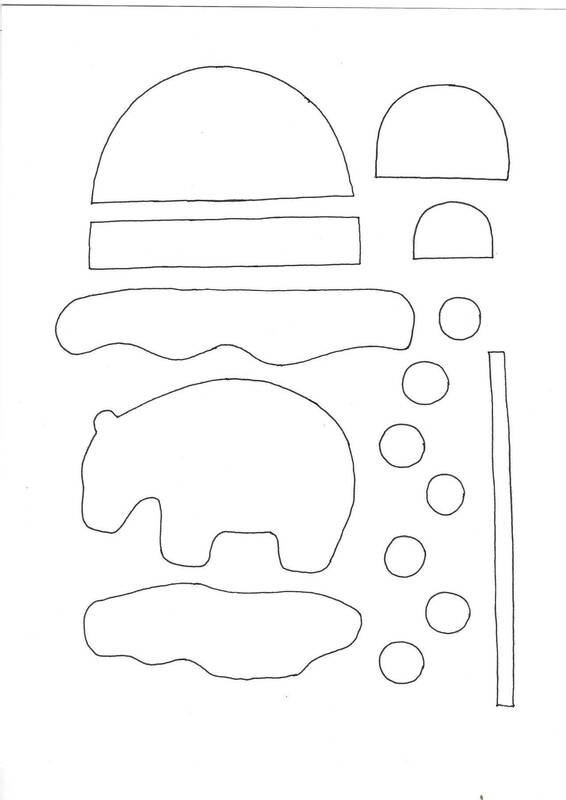 The Cat offered to make a pot of tea, and the Bear and the Hedgehog helped lay out a picnic lunch. Jackie Azúa Kramer’s multi-layered story delves into the large points and small nuances of relationships old and new. The Elephant’s green umbrella is both a subject of envy and a uniting object. It also serves to demonstrate Elephant’s ability to stick up for himself as well as his willingness to share. As each animal presents an imaginative and compelling reason why the green umbrella belongs to them, the Elephant rejects the story while accepting the friend. In each animal’s lushly described imagination, Kramer does a beautiful job of showing readers how each of these friends are similar. She reveals that while friends can have different opinions, they can still find common ground. Maral Sassouni’s dream-like illustrations are both exotic and homey. Village houses give way to turreted and domed towers, and the imaginative stories the animals tell are accompanied by details as free, cozy, or eccentric as their tales. The Elephant’s account is cleverly rendered in sepia tones, showing the age of the memories and who the original owner of the coveted umbrella really is. The final images of the five new friends sharing adventures in the green umbrella are sure to delight little ones. The Green Umbrella is a perfect book to share on rainy days or sunny days. With humor and creativity, the book provides an opportunity to talk about the nature of friendship and sharing with children. It would make an often-read addition to public, classroom, and home libraries. 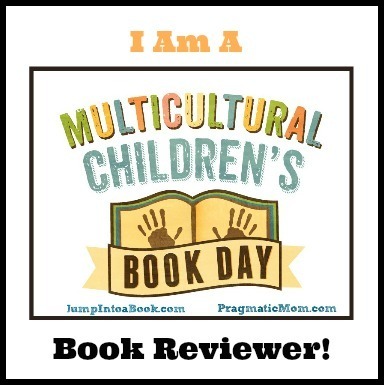 Discover more about Jackie Azúa Kramer, her books, and a fun book-related activity on her website! Learn more about Maral Sassouni and her artwork on her website! Don’t wait for a rainy day to watch The Green Umbrella book trailer! These friends are all enjoying a day out! 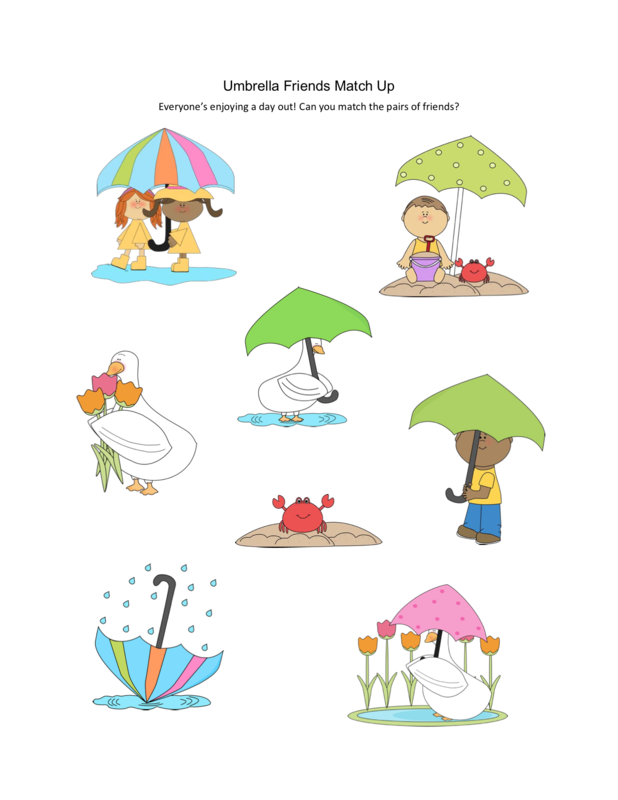 Can you find the matching pairs in this printable Umbrella Friends Match Up Puzzle? When you grab your umbrella and open it (not indoors of course! ), do you ever think about what an ancient device it is? The umbrella was invented over four thousand years ago and appears in art from ancient Greece, Egypt, China, and Assyria. The Chinese developed waterproof umbrellas to use in the rain by waxing and lacquering paper umbrellas. One of the first umbrella shops opened in London in 1830 and is still open for business there today. If it’s raining or snowing where you are today, celebrate the holiday by taking your umbrella for a spin. If you’re having fair weather, why not get yourself a new umbrella? After all, spring is coming! The steady sssshhhhhh of gentle rain is a sound that never fails to relax. With this easy craft, you can create your own rainfall for whenever you need to de-stress. Are you feeling a bit parched? Is the grass turning brown and the garden droopy? Would a rainy day be the perfect antidote? Well, today, wishing might just make it so! Throughout history people have relied on rain to nourish crops, fill up reservoirs, and cool things down. Rain is a crucial part of the ecosystem and a weather pattern that deserves its own holiday. So, no saying “Rain, rain, go away. Come again another day.” You can do that tomorrow!